Getting Vietnamese visa is so quick and easy by making a Visa on arrival. We will help you to make an approval letter then you can simply get your visa once you arrive in any international airports in Vietnam or any Vietnamese Embassy/ Consualate in any foreign countries. Let’s finish these few simple steps then Welcome scan of the first page on your passport with full information like: your full name, pto Vietnam. - Step 1: Send us an email which you attach a assport number, date of birth, nationality. Also, please inform us arrival date and visa length. - Step 2: You will get our quick confirmation, invoice and show you how to do your payment. Please check confirmation after settling your payment. - Step 3: We will process doing your approval letter visa within: 3 official working days as normal progress. If you need an urgent approval letter, please check the price list below. + Print out the pages with color (to get the red stamp on). + Prepare cash: 25 USD (1 month, 3 months single entries visa)/ 50 USD (1 month, 3 months multiple entries visa)/ 95 USD (6 months visa)/ 135 USD (1 year multiple entries visa) to pay the stamp fee at the airport. + 2 photos size as a normal passport photo. + Passport has expiry date more than 6 months. - Step 5: On the day when you arrive at any international airports (Phu Quoc, Da Nang, Tan Son Nhat, Noi Bai), show all documents you prepared. You will easily get visa stamp at the Immigration department officers. 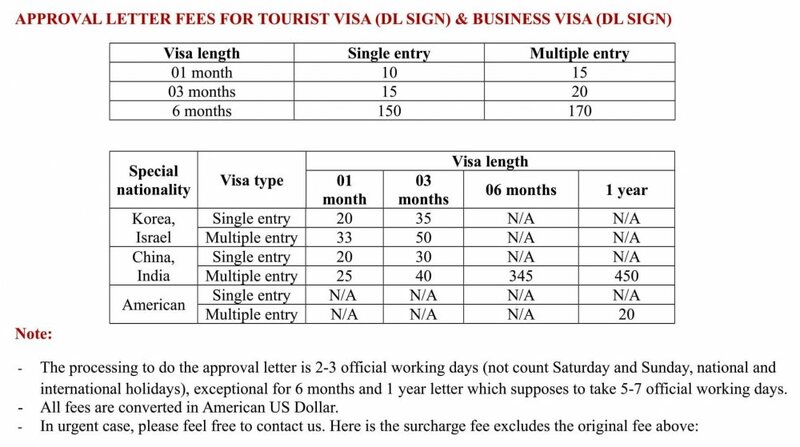 Please visit our visa page visagovietnam.net if you would like to have more information about visa extension, resident card, working visa or work permit.